Welcome to Strong With Grace! 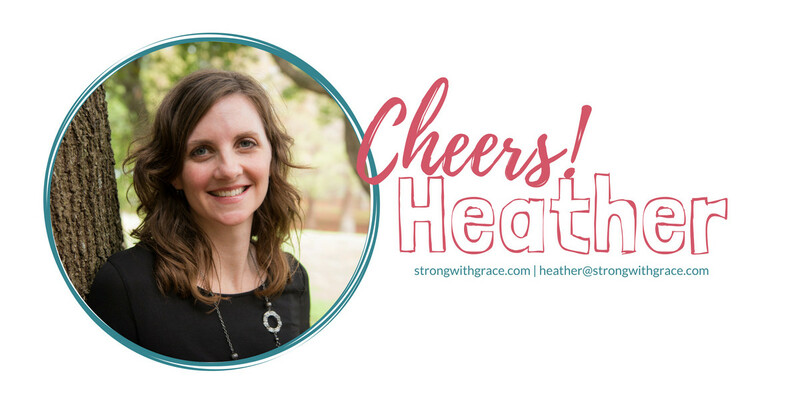 I’m Heather Goffrier, and I’m so glad you’re here! A few years ago, I struggled to be confident and organized as I stayed at home with my daughter, managed the house, blogged part-time, and endured sickness for 40 weeks while pregnant with number two. I lacked confidence, and the opinions of others strongly influenced me. I didn’t want people to dislike me, whether in person or online, so I was afraid to stand up for my own opinions. Even though I was walking with the Lord, I didn’t realize how I’d let the enemy’s lies infiltrate my thoughts and beliefs. Thoughts like, “I’m not good enough,” “I can’t balance all I need to do,” and “I’m weak” constantly sat at the back of my mind, subtly draining my joy. I didn’t realize I had fallen so far inside the trap of negative thinking. Now I’m Mom to not one, not two, but three beautiful girls, and amazingly, I am so much more grounded as a mom. I delivered our third while my husband was on deployment. That was crazy in itself, but the deployment brought many challenges with it including moving into a different home (without Dad there to help), managing a remodel project from afar, and recovering from a c-section with three kiddos to manage. Thankfully I had lots of family support. But the most amazing thing was the peace and confidence I had throughout all the chaos. 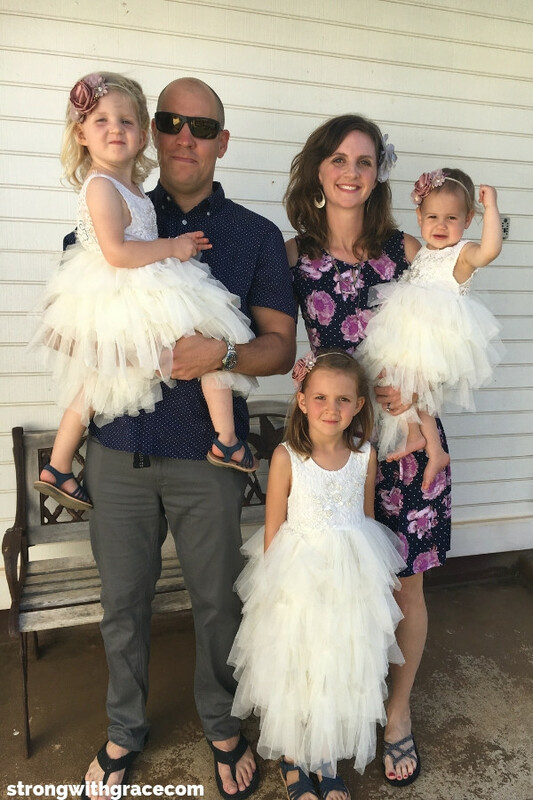 My handsome hubs and the little ladies as flower girls. I learned that the identity that God gives me is the only one that matters… not what others think of me, not what the negative voices in my head try to convince me is true. Through the help of others, and leaning into God’s truth, I learned the power of silencing the enemy’s voice of discouragement and doubt. I started to truly believe the truths in Scripture that I knew in my head, but wasn’t living out– all the amazing promises of peace and joy that are ours for the taking. After having baby #3, I realized I couldn’t skate by on grocery shopping at the last minute and not keeping up on daily tasks. Though I have a lot of growth to do in this area, I’ve made huge strides that have made a world of difference in the flow and of our household and daily enjoyment of our kids. 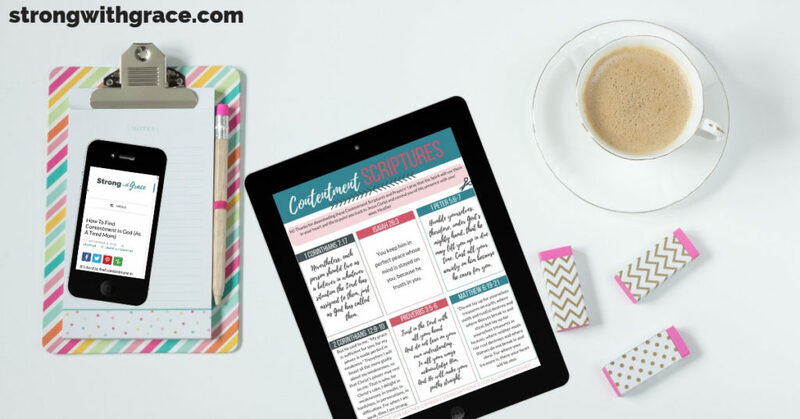 Ultimately, Strong With Grace is about helping you to experience that same peace and confidence, giving you practical tips to help along the way, and pointing you to the true source of our strength as confident women rocking mom life: Jesus. My kitchen is a disaster on many days, toys overrun our living room, and the kids are constantly begging for a snack five minutes after we got up from lunch. I know you know what I mean! But I am rocking mom life way more than I was a few years ago. And isn’t that what we really want? To become better mothers, better wives, not because we attain perfection but because we are confident in who we are– who God made us to be. And knowing that, even in our mess, we are the woman and mom that our family needs. I really appreciate you stopping by! I want to encourage you, cheer you on, and high-five you when you conquer your challenges, even if they’re baby steps! And, I’ve created a little gift for you that will help you rest and be content in your current situation knowing that God is with you and walking with you. You can grab your copy below!